Trump Picks Republican FCC Lawyer, Former Telecom Lawyer, For Commissioner Seat : The Two-Way President Trump will name former telecom attorney and current FCC lawyer Brendan Carr to serve as a commissioner. He is expected to back Chairman Ajit Pai's efforts to undo net neutrality rules. Earlier this month, President Trump renominated former FCC Commissioner Jessica Rosenworcel (left), seen here in 2013 with current commissioners Mingon Clyburn (center) and Ajit Pai. 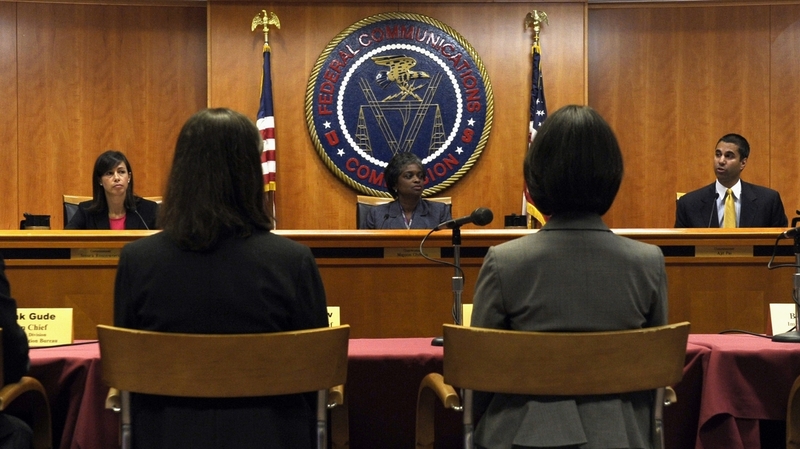 The FCC, which regulates the country's telecommunications, is supposed to be directed by five commissioners. But currently, it just has three: two Republicans, Pai and Michael O'Rielly, and Democrat Mignon Clyburn. The president appoints commissioners to five-year terms, but they must be confirmed by the Senate. Trump nominated Democrat Jessica Rosenworcel to the other open seat on June 14. Rosenworcel had been a commissioner until her term ended in 2016. No more than three members of the commission may be of the same political party; if both Carr and Rosenworcel are confirmed, Republicans would have a 3-2 majority. The president appointed Commissioner Ajit Pai as the FCC chairman in January. "Brendan's expertise on wireless policy and public safety will be a tremendous asset to the Commission," Pai said in a statement. Carr, Pai's legal adviser for three years, is expected to back the chairman's efforts to undo the FCC's 2015 net neutrality rules. The rules were passed when Democrats were in the majority and treat telecom providers such as Comcast and Verizon like public utilities, subject to stronger regulation. They prevent companies from blocking certain websites and slowing download speeds or from offering "fast lanes" for websites that pay extra for them. Broadband companies and industry groups have challenged the rules in court; a federal appeals court upheld the rules last year. In May, the FCC's two Republican commissioners, Pai and O'Rielly, voted to propose a review of the current net neutrality rules, with the goal of rolling back rules that the industry finds "burdensome." "The FCC's new proposal — titled 'Restoring Internet Freedom' — considers not only whether to undo the legal approach that enforced those rules, but also whether the rules were warranted in the first place. As Pai puts it, the proposal would 'return to the Clinton-era light-touch framework.' He has also proposed to stop treating wireless carriers the same as cable providers." According to the Los Angeles Times, both Carr and Rosenworcel are expected to be confirmed by the Senate, and a final vote on changes to FCC regulations isn't likely until the fall. An earlier version of this story misspelled Michael O'Rielly's last name as O'Reilly.